Nothing beats Christmas as the happiest time of the year, except for maybe the family squabbles, burning the Christmas turkey, or losing the neighborhood Christmas light competition. To help you avoid one of these holiday catastrophes, we continue the Christmas Grilling Series with Herb and Red Wine Rotisserie Leg of Lamb. This is a meal that just looks classic and seasonal in presentation alone, but is also fully captivating in taste and aromatics from the herbs and marinade. This preparation uses a marinade before cooking, and reserves a portion of the marinade for basting while on the rotisserie. The marinade is a combination of dry red wine, lemon juice, mint leaves, rosemary and other herbs, garlic, brown sugar, Worcestershire sauce, salt, and pepper, and is rubbed into the leg and refrigerated for two hours. The mixture will permeate into the muscle tissue softening, seasoning, and moisturizing the leg to prepare for the grill. The sauce for basting is simply the reserved marinade thinned out a little so it can be applied liberally throughout the grilling time. Using the rotisserie provides uniform cooking and browning at a medium-high temperature. The finished leg sings of moistness, herbal aromas, and caramelized sugars; and for a bonus, it may distract certain family members from starting those seasonal squabbles, thus avoiding a second catastrophe (we can only hope!). So fire up the grill with the Christmas Grilling series, and there may even be time to work on that neighborhood Christmas light competition and make it a trifecta of victory! Cut away and excess fat from lamb leg. Rise and pat dry. Combine marinade ingredients in food processor. Remove 1/4 cup and set aside. Apply remaining marinade liberally onto lamb leg. Place into a deep dish, cover and refrigerate for 1-2 hours. Meanwhile, prepare baste. You can use some of this mixture to inject directly into the lamb prior to cooking. Preheat grill for medium heat. 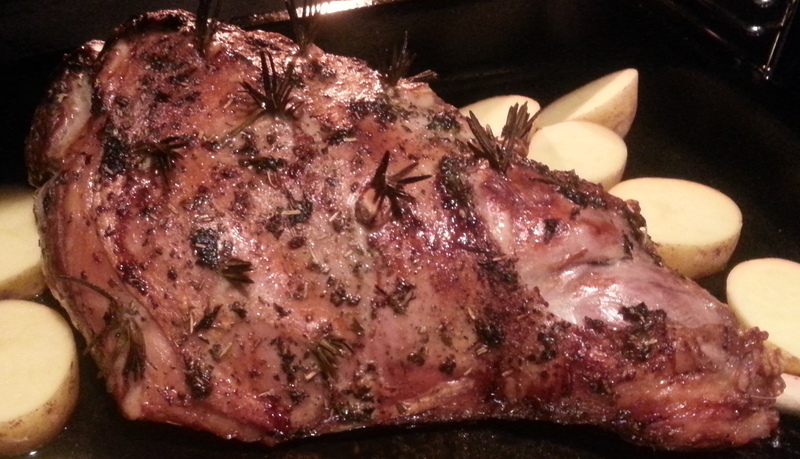 This is best done with a drip pan underneath the lamb to prevent drippings from causing a flare-up. Putting a bone in leg of lamb on a rotisserie skewer can be a little challenging. A long thin knife or large metal skewer can be used to make a hole by starting at the bone end and working it though the thickest part of the leg. It is important to try to find the center to balance the leg of lamb on the rotisserie rod. Secure with the rotisserie forks tightly. It might be necessary to tie the leg with kitchen twine. Place the leg of lamb on grill, making sure it is properly centered and able to turn freely. Place drip pan under and add several cups of water to the pan. Keep grill on medium to medium-high heat. Water in pan should not boil. If the grill has a rotisserie burner use that only. If the grill doesn’t have a rotisserie burner, but has more than two main burners use the burners on either side for indirect grilling. Grill lamb leg for about 20 to 30 minutes per pound. Check temperature in the thickest part of the meat, avoiding the bone. Once lamb has reached and internal temperature above 145 degrees F (or higher if desired) remove from heat and tent with aluminum foil for 10 -12 minutes. Carve and serve.